The Bard of Boston: From Celtic to Country: 3 Ways the Irish and Scottish Influenced "America's Music"
The influence of Celtic folk music in the South began before the start of the American Revolution. As early as 1717, waves of Scots-Irish immigrants were pouring into North America. By 1790, 3 million of these immigrants called America home. The Scots-Irish -- also known as Scotch-Irish or Ulster-Scots -- were Presbyterian Scots who had previously settled in Ulster as a result of Britain's plan for a Protestant plantation in Ireland. Separate waves of Scottish immigration to North America occurred starting in 1725 as a result of the Highland Clearances, while Irish Catholics would not arrive on the scene in great numbers until 1847: a result of the Potato Famine. Despite their ideological differences, these Scottish and Irish immigrants shared a Celtic musical tradition, which employed many of the same techniques for playing, composing and arranging music. These techniques had a profound influence on that "country sound" we are familiar with today. When two or more singers sing in harmony, or harmonize, the notes they sing are different, while the resulting sound they produce is unified and -- typically -- pleasing to the ears. Of course, the Irish and Scottish didn't invent the concept of harmony, but they did have a tradition of using it in group sing-a-long settings. Gaelic-speakers in the Old World were distilling and drinking moonshine -- and crooning harmoniously, the perfect accompaniment for a bit of Poitín -- well before Appalachian "hillbillies" began carrying on the tradition in the New World. Like their Celtic musician forefathers, country musicians often employ vocal harmonies in the choruses -- or repeated portions -- of songs. This strategy helps stress the importance and increase the forcefulness of the choruses while also separating them sound-wise from the verses. Check out the use of vocal harmonies in the choruses of Okie from Muskogee by Merle Haggard and compare it to the use of harmonies in the choruses of the Celtic song, Mairi's Wedding, as performed by The Clancy Brothers & Tommy Makem. If you find that some country or Celtic songs have hypnotic qualities to them, mesmerizing you as you listen, this phenomenon could be the result of a drone. A drone is a note or chord that sounds continuously throughout most -- if not all -- of a song, providing an underlying, trance-like accompaniment for the song's melody. Musicians can create drones vocally or with virtually any pitch-controlled instrument. Country musicians, such as fiddlers and slide-guitarists, adopted droning from Scottish and Irish settlers, who were accustomed to producing drones with fiddles as well as bagpipes. Listen for the drone in Fiddlin' John Carson's song, He Rambled, and compare it to the drone in the Scottish march, The Campbells Are Coming. On a side note, I am curious to read the book, Drone On! : The High History of Celtic Music, by Winnie Czulinski, but would prefer to get it on my Kindle. I implore you to go to Amazon.com (click the link above) and request that the publisher produce a Kindle version! Listen to a country music radio station long enough and you will hear a sob story: a song about a father abandoning his son (see Walk A Little Straighter Daddy by Billy Currington), a song about a woman abandoning her man (see When I Call Your Name by Vince Gill) or -- worst of all -- a song about a boyfriend dumping his girlfriend and then letting his new girlfriend drive his pick-up truck, something he never let the old girlfriend do (see Picture To Burn by Taylor Swift). The nerve of that guy, really, what a jerk. Singing sorrowfully about the heartbreaks we suffer in life may not have been a distinctively Irish or Scottish creation, but Irish and Scottish immigrants certainly brought a tradition of sob stories with them when they showed up on the shores of Amerikay. Subject matter included longing for love (see Black Is The Color), losing children (see The Wife of Usher's Well) and leaving behind a troubled home only to encounter new troubles abroad (see By The Hush). Before Alan Jackson and Jimmy Buffet sang It's Five O'Clock Somewhere, before Tracy Byrd sang Ten Rounds With José Cuervo and before Brad Paisley sang the utilitarianly-titled Alcohol, Celtic musicians were singing drinking songs that put forth similar, contradictory messages: alcohol is evil (see Whiskey, You're The Devil), but drinking it can be comforting and -- overall -- a quite joyous experience (see Beer, Beer Beer). Homer Simpson summed up the lyrical style of Celtic/country drinking songs beautifully when he toasted, "Here's to alcohol: the cause of, and solution to, all of life's problems." 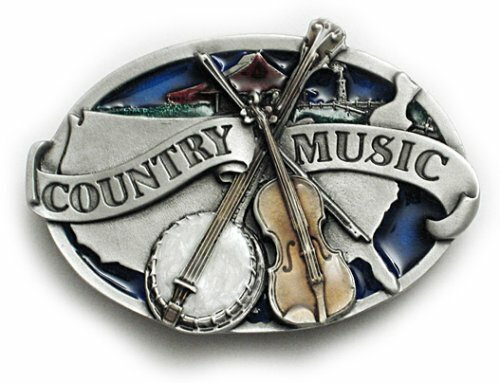 The use of the fiddle in country music predates the use of the guitar. To clarify, a fiddle is -- physically -- the same instrument as a violin. The difference is perception: most classical violinists get offended when you call them fiddlers, as they consider fiddling to be an informal, inferior type of playing... what a bunch of jerks. Scottish and Irish immigrants brought fiddles with them to North America and successive generations in the South morphed their Celtic jigs and reels into tunes of their own. Many of the founding fathers of country music, such as Fiddlin' John Carson, mentioned above, and Eck Robertson, were solo fiddlers. Apart from bringing fiddles and fiddle music to the American South, the Scottish and Irish brought highly energetic and interactive dancing styles to accompany fiddling, which formed the basis for country square dancing. The plot thickens: in the 19th century, banjos crossed the Atlantic -- for a second time -- and musicians in Ireland and Scotland began incorporating the African/American instruments into traditional Celtic music. The Dubliners are a great example of a Celtic folk band that adopted the banjo. ScotchIrish.net: Who Are The Scotch Irish?